eCite - Phronetic legal inquiry : an effective design for law and society research? 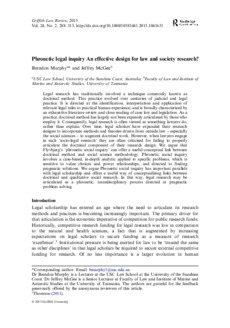 Phronetic legal inquiry : an effective design for law and society research? Legal research has traditionally involved a technique commonly known as doctrinal method. This practice evolved over centuries of judicial and legal practice. It is directed at the identification, interpretation and application of relevant legal rules to practical human experience, and is broadly characterised by an exhaustive literature review and close reading of case law and legislation. As a practice, doctrinal method has largely not been expressly articulated by those who employ it. Consequently, legal research is often viewed as something lawyers do, rather than explain. Over time, legal scholars have expanded their research designs to incorporate methods and theories drawn from outside law – especially the social sciences – to augment doctrinal work. However, when lawyers engage in such ‘socio-legal research’ they are often criticised for failing to properly articulate the doctrinal component of their research design. We argue that Flyvbjerg’s ‘phronetic social inquiry’ can offer a useful conceptual link between doctrinal method and social science methodology. Phronetic social inquiry involves a case-based, in-depth analytic applied to specific problems, which is sensitive to value choices and power relationships, and directed to finding pragmatic solutions. We argue Phronetic social inquiry has important parallels with legal scholarship and offers a useful way of conceptualising links between doctrinal and qualitative social research. In this way, legal research may be articulated as a phronetic, transdisciplinary process directed at pragmatic problem solving.